There were three main raids that evening. 115 Sqaudron participated in them all, sending 9 bombers to Russelsheim, 14 to Brunswick and 2 (including Johnston) to Falaise. The latter target was a German troop concentration on the road just north of Falaise. Two Witchford aircraft, Hockey and Belyea, were lost on the Brunswick mission, which was attempted without a Pathfinder, and using only H2S. Although both of these pilots survived, all of their other crew members were killed. CO’s parade as usual this morning and also as usual, none of my boys were there but there was no roll call. Did an air test on “P” for Peter in the afternoon – waited from 2:30 till 6:15 to get airborne and then I turned it down as fit to be scrubbed from the Squadron (I’d hate to fly it with a load!). The W/C is flying it tomorrow for the final verdict. Got down about ten to eight p.m. to eat then back to bunk about 8:30. Bick came in just as I was settled and said with a great grin on his face that the W/C wanted two more crews for a special op. So I galloped up to the mess and phoned (and volunteered Bickford and his bunch in return for him getting me) so we went to Falaise to help out the Canadians. Flew at 7,000 all the way – no opposition at all. 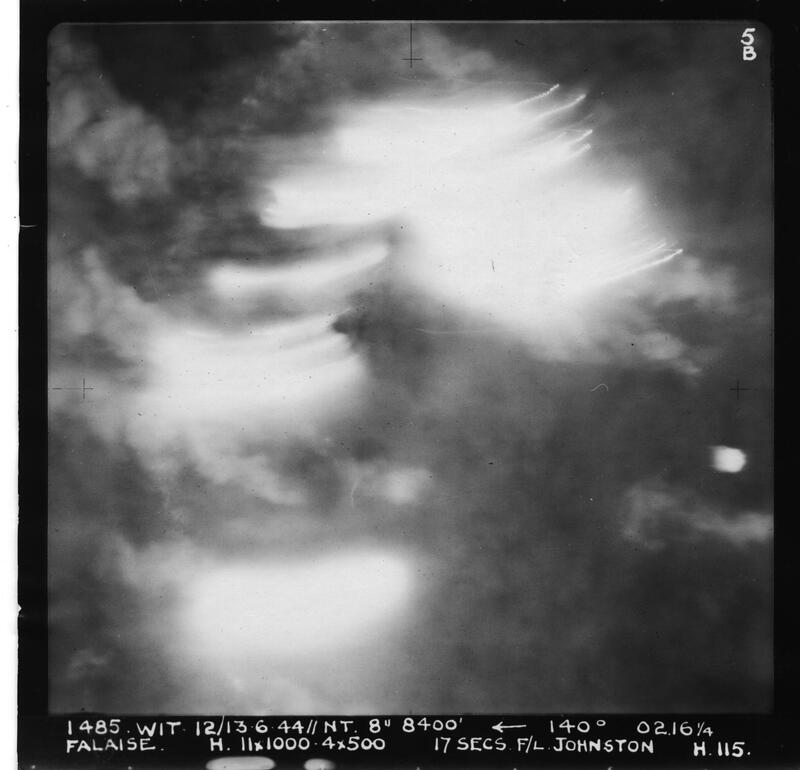 There were fighter flares over the target and on the way out but they were always about five miles behind us. We dodged two fighters on Fishpond too – but aside from that everything was very quiet. That’s number twenty anyway. We took off at 12:30. The other boys went to Germany (Brunswick and Russelsheim). We lost Hockey and Belyea. Heard from Mom this morning.